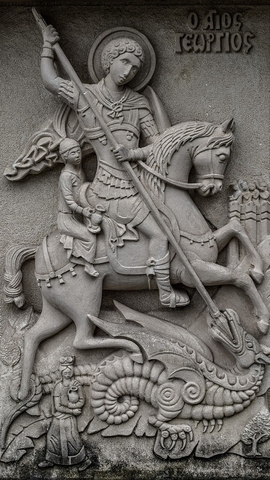 The person we know as St George was probably a soldier who lived in Palestine early in the fourth century. He was martyred for his faith around the year 301 at Lydda, and he became known throughout the East as 'The Great Martyr'. Some of the English churches dedicated to St George have been with us a very long time and pre-date the Norman Conquest. George replaced Edward the Confessor as patron saint of England following the Crusades, when soldiers returning to England brought back with them a renewed and enthusiastic following of St George. George's new position was firmly established when King Edward III made him patron of the Order of the Garter. Mark the Evangelist was probably a cousin to Barnabas who accompanied Barnabas and Paul on their first missionary journey. Following this he went to Cyprus with Barnabas and then to Rome with Paul (and later also with Peter). Mark probably wrote his gospel while he was in Rome and the gospel writing is based on Mark's memories combined with Peter's preaching. Mark's is the earliest gospel to be written, and its sharp and clear message has an immediacy which speaks as well to us today as to its original readers. He's clear about the apostles' weaknesses, and their lack of understanding that Jesus would be called on to suffer for the redemption of the world. For Mark, for people to share in the glory of the resurrection means also for them to share in the sacrificial (generous) giving of self to others, in body and spirit. For Mark, sharing the gospel is a real 'Easter Season' message because in essence sharing the gospel is excessively generous while being also ultimately sacrificial. We remember St George on 23rd April and St Mark on 25th April. With blessings for the Easter season.